Fantastic ! I love the way you rendered the "folds" on the bag ! You have got a terrific style. I love it! The rope and the bag are just stunning. Your work is exquisite. Wonderful capture of the posture(?) in this bag! I can't keep up with you Everyday in May folks. Day after day, you turn out beautiful drawings. This bag is great, the rope is amazing, and the others are quite wonderful too. 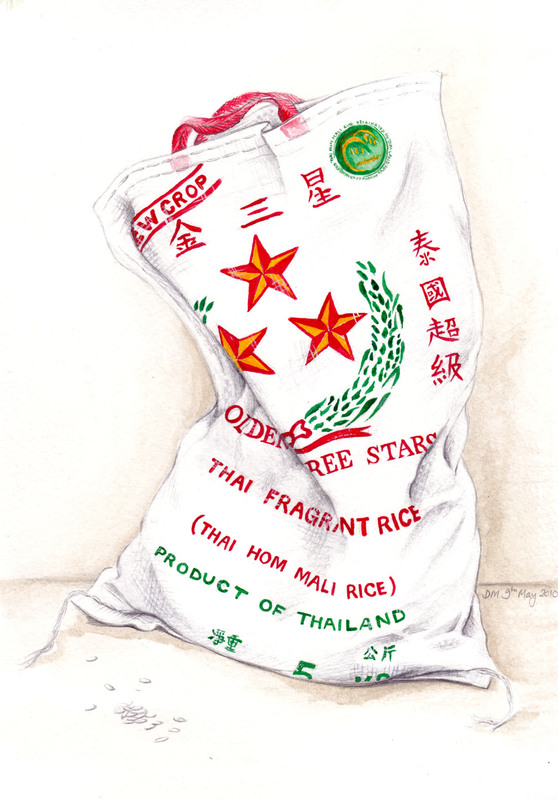 I like the rice bags the most says Francesca Dunster. I think you are really good at drawing. and thank-you Francesca D, miss Friday morning art class, hope school is good! Another one that has awesome chinese writings on it =) I really like how natural it looks, the colors and the way the sack folds. 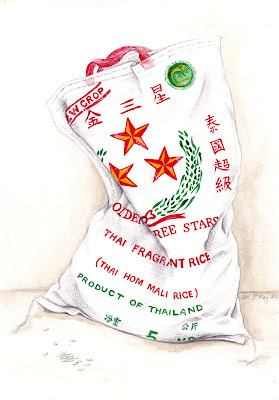 How I miss fragrant rice from Thailand... I can get them here too but boy are they expensive!